tl:dr: How the smart money can tell you what’s going on in the private market. And how it can’t. Editor’s note: Journalist Max Cherney wrote today’s piece. It’s pretty damn good. 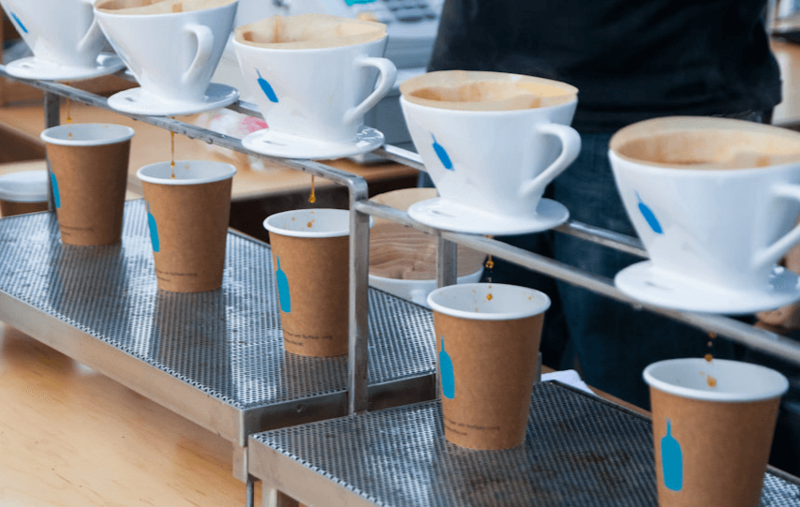 Everybody in Silicon Valley loves Blue Bottle Coffee—except the mutual funds that have invested in it. Morgan Stanley’s Multicap Growth mutual fund, which bought $2.68 million of Blue Bottle in 2014, has recently marked down the company’s shares nearly ten percent to $16.84, according to disclosures required by the SEC. Fidelity has lost more than 50 percent of its investment thus far, according to its own analysts, which valued Blue Bottle stock at $15.46 in the first quarter of this year. Over the past two years, Blue Bottle has raised nearly $116 million from well known venture capitalists and celebs such as Tony Hawk; the resulting investments bumped shares to at least $33.32—the price Fidelity’s Blue Chip Growth Fund paid for its roughly $3 million of shares last year. Morgan Stanley bought in at $14.47 per share, and in the fourth quarter of 2015 marked its value at $18.63 a share before slashing the price. Sold as a way to make the growing practice of crowdfunding legit, the JOBS Act also contained a provision that has had a profound impact on how companies are funded and at what point they go public: the fed axed the 500 rule—requiring a company to go public after it had more than 500 shareholders—and now only requires a company to IPO after it hits 2,000 accredited investors (though the number remains at 500 if those investors are not accredited). Without the JOBS Act, Airbnb and Uber would likely have been required to go public (as Facebook was). Hence the number of large, private companies has swelled—why put an enterprise at the mercy of Wall Street’s grueling quarterly expectations if not absolutely necessary? But unlike public markets, which offer a relatively accurate price of any security—at least in terms of what an investor expects to receive for a share, should they wish to unload it that moment—private markets offer no such millisecond to millisecond expectation for a given security. That’s resulted in (sometimes) wildly differing valuations for the same stock. Take, for example, Fidelity and Morgan Stanley’s current valuation of Blue Bottle, which differs by six percent. For a publicly traded company, a six percent move in the price would likely correlate with some new, material information being released to the public that surprised investors—beating analyst earnings estimates, for example. Mutual funds themselves insist their valuation methodology is rock-solid, according to portfolio managers at T. Rowe Price and a representative from Fidelity. But details from the funds are hard to come by. T. Rowe portfolio manager Henry Ellenbogen, who has been credited with teaching mutual funds how to invest in private companies, told Mattermark in an emailed statement that the company follows “the same due diligence process we undertake for any investment.” This includes evaluating the quality of executives (he emphasized the importance of this component), financial information, market opportunity, business model, and the valuation of comparable public companies—which often move with the market. He would not comment on specific companies. Fidelity issued a prepared statement defending its positions in pre-IPO companies. Like every mutual fund, Fidelity is required to hold less than 15 percent of total assets under management, and rarely move the needle on a mutual fund’s performance (there are exceptions). Fidelity would not speak on the record about its valuation process or specific investments. Morningstar senior analyst Katie Reichart says that valuation criteria range widely, and it often depends on the philosophy or management style of a particular mutual fund. In almost all cases, she says, funds have some kind of independent committee that values private firms to prevent a conflict of interest (fund managers would usually like to see stock value go up, which would increase the value of the portfolio). To hear investors tell it, venture capital investing is an art not a science. One of the half-dozen venture capitalists interviewed for this report went as far as to say that nobody, not even venture capital funds, can value companies appropriately. Though that may sound absurd, it shouldn’t be. Like most investors, mutual funds included, venture money also takes a portfolio approach, with the hope that one or several companies will pay off big, even if many of the others do not. Venture capitalists are, in short, looking for a Black Swan. “The way I look at valuations is that we’re building a portfolio approach in our funds,” AITV general partner Bill Malloy said. For Malloy, each investment often requires a unique approach. For some investments, he looks at revenue. For others, like mutual funds, Malloy looks at comparable public companies. He will also make bets on a specific team of executives. Another venture capitalist told Mattermark that a good example is Fidelity’s recent investment in Snapchat. The mutual fund, prior to its most recent funding round, didn’t get a seat on the board, and as a result doesn’t have access to the same amount of financial information as investors that have secured a board seat—so it’s worth thinking about the $30.72 Fidelity assigned to its shares. Fidelity would not comment on its position on the board. In Blue Bottle’s case, the public disclosures reveal a much more substantial loss in value—and not from a tech company with an uncertain path towards profitability. Coffee giants such as Starbucks (which has had a rocky year, but hasn’t lost anywhere near half it’s value) have created a roadmap to national and international expansion. But as a result of the relative valuation opacity, it’s hard to know what to make of the changes to Blue Bottle’s stock price and discrepancies in valuation. It could be a result of weak stock market performance—in Q1, the period that the Morgan Stanley and Fidelity valuations are based on, the market did badly—or the company’s non-public financials. Though Fidelity’s 50 percent markdown suggests a significant change in how mutual fund’s analysts viewed the corporation. Blue Bottle spokeswoman Ryley Johnson declined to provide access to executives or comment. What’s for sure: Blue Bottle insists on doing things differently. Its CEO is supposedly a “control freak” that doesn’t grow the company in a logical fashion. For example, Blue Bottle shut down its wholesale business in 2015 that was supposed to account for about 20 percent of the company’s overall sales (much lower than competitors, though). And that change in business strategy could have driven investors to take a step back. Or investors have figured out that America writ-large doesn’t want to pay four bucks and wait ten minutes in line for a cup of coffee. As with other market signals, mutual funds’ quarterly marks are no exact science. In spite of that, directional shifts in said marks from similar funds (Morgan Stanley and Fidelity, in this case) valuing the same company could be indicative of its recent performance. But buyer beware when staring at data with only half an eye open. When more of these unicorns do finally go public—as Twilio recently set out to—it will become a parlor game to correlate past quarterly performance to their various mutual fund revaluations. We’ll be able to see who got it right, and who got it wrong, at least in some cases. In others, such as the unicorn of unicorns (Uber), if it stays determined to remain private for as long as it possibly can (to wit, the Journal reported late Tuesday that Uber is looking for a loan of up to $2 billion), it could be some time that we are stuck looking through a glass, darkly. Certainly, 2014 was an odd year, but the company is a pretty good analog for market enthusiasm, ensuing private dollars from tech-focused investors, and later revaluations by more sober boring investors. Featured Image via Flickr user Saaleha Bamjee under CC BY-SA 2.0. Image has been cropped.